Bryans Allwins, Gapwin, Elevenses, Pilwin, worl borl, etc. In the 50s and early 60s, Bryan produced a number of different Allwin designs. 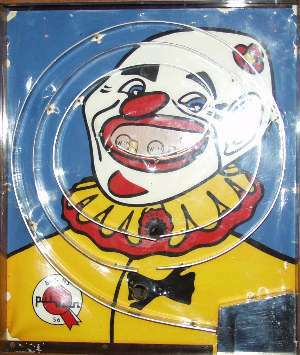 Several of these used the same basic mechanism, but with a different design of playfield which introduced new tactics into the game. 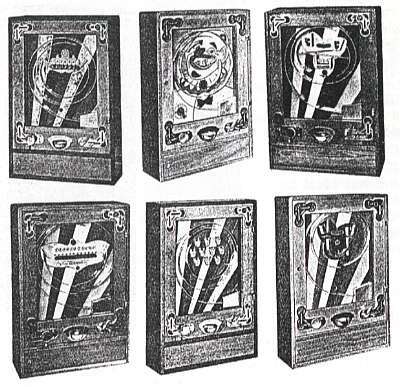 The Allwins were available in a number of different case styles. 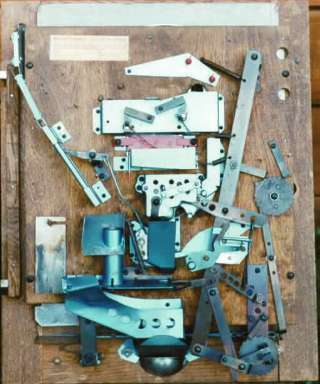 Bryans Allwin mechanism was itself revolutionary. It offered multiple payouts, and could be customised by the operator to offer a large number of different combinations of payout rates and replays. These adjustments could be made in a few seconds, and without tools. Extra payout slides were provided inside every machine, and even these could be changed without tools, in less than a minute. The spring-loaded payout tubes were also designed to be anti-jamming. 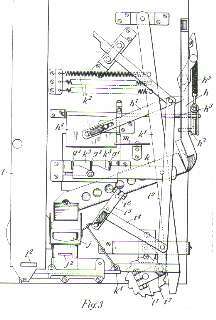 Bryans mechanism also incorporated his patented Variable Pressure Unit. This device varied the pressure of the hammer spring each time the machine paid out. The idea of this was to prevent the ball being struck with the same pressure each time, even though the trigger was depressed to the same position. See here. 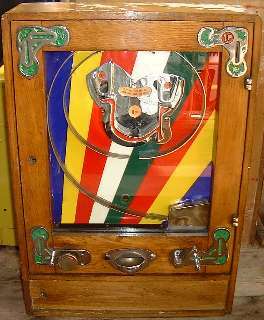 Though not a conventional Allwin, this machine is featured on this page because of the similar gameplay. Part of Bryan's patent specification for the Rockets. 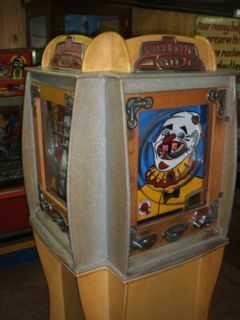 The game offered a payout of coins or a prize. This writing was found behind the backflash of machine No.128. Maybe it was done in the workshop whilst they were deciding what wording to put on the instruction card? 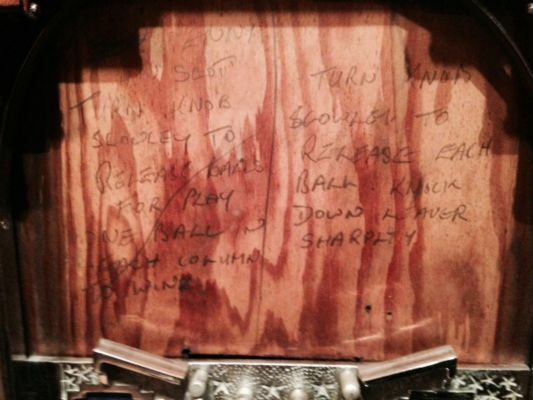 The left-hand one reads: "Turn knob slowley (sic) to release balls for play. One ball in each column to win." The right-hand one reads: "Turn knob slowley to release each ball. Knock down leaver (sic) sharply." 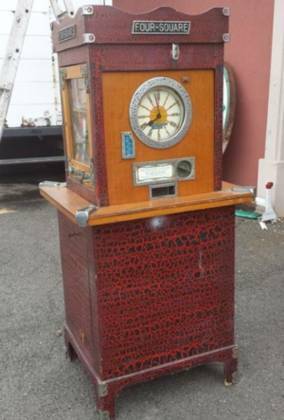 The actual wording on the machine reads: "Drop penny in slot. Turn knob slowly to release 3 balls into play - one at a time. Drive balls up by pressing down lever smartly." 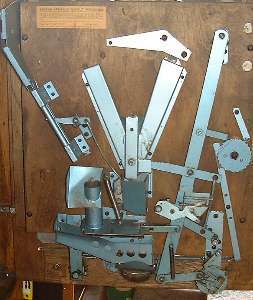 There are also signs that the door lock was intended originally to be put on the left-hand side. This puzzling 'STARS' variation was found in Australia. Whether it is a factory original or a later modification I don't know. But why would anybody go to the trouble of making a new backflash with a different name? If you study the Rockets casework, you will see that stars do feature quite heavily in the artwork on the backflash, and on the castings. The payout knob is also in the shape of a star. 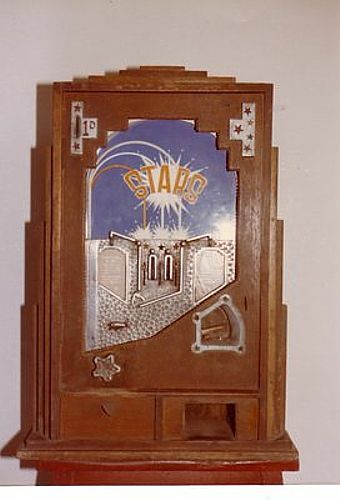 Could it be that 'Stars' was the original name, which was later changed to Rockets? Did something happen around 1936 to bring rockets to the public attention? 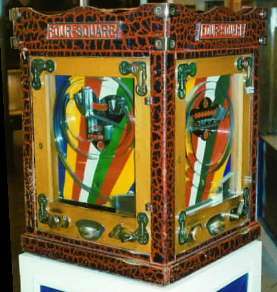 The more you look at it, the more that 'Stars' seems to be the more obvious name for this machine. 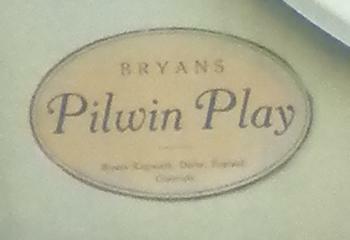 The Pilwin Play was Bryans first conventional Allwin, with the possible exception of an early version of the Fivewin. The object of the game was to shoot the ball into Pilwin's mouth to win. To keep costs to a minimum, the early backflashes were hand painted, and then coloured in using Reeves paints (apparently by Mrs Bryan!). 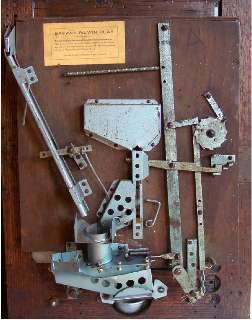 Bryan's early Allwin mechanism was not yet fully developed. 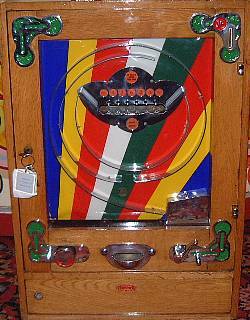 It needed two ball exits in the playfield, and was only single payout. He perfected his universal Allwin mechanism two years later with the Elevenses. 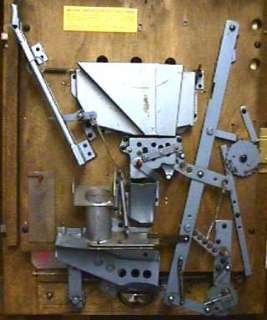 The improved mechanism then went on to be used in a number of different Allwins, including a new and improved version of the Pilwin which was launched in 1956. 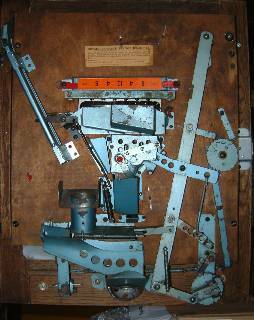 As can be seen, the early mechanism was fitted with the Variable Pressure Unit, which varied the hammer pressure every time the machine paid out. This refinement was probably necessary on the Pilwin Play due to the ball trajectory being more predictable along the closed loop spiral track. With the open spirals used in the later Allwins, the VPU was not really necessary. 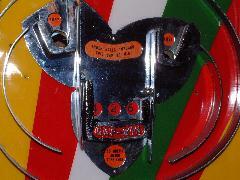 Nevertheless, it was retained in the later mechanism, probably as a sales gimmick. 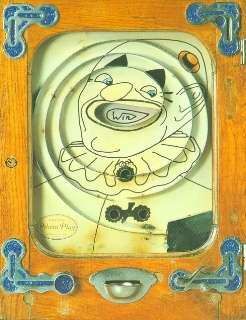 This was a much improved version of the earlier Pilwin Play taking advantage of the improved 1955 Allwin mechanism. 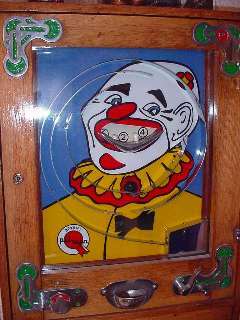 As before, the object of the game was to shoot the ball into Pilwin's mouth, but the addition of the two teeth now formed three separate winning cups! Like Bryans other Allwins this was now a multiple payout game, with the three cups paying out different amounts; although the operator could vary the amounts, and also select a replay option. The spiral track was redesigned from a closed to an open spiral, and it was also possible to vary the degree of difficulty by adjusting one section of the track, at the top of the inner spiral. It remains a mystery why Pilwin's tongue comes out of his chin! 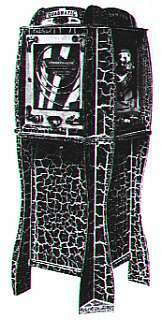 The improved Pilwin was initally called 'Pilwin 56', to help distinguish it from the previous version. Some time later, possibly as late as the 70s, the '56' was removed from the backflash as it no longer had any relevance. Certainly, backflashes being sold by the factory in the 90s had the '56' removed. 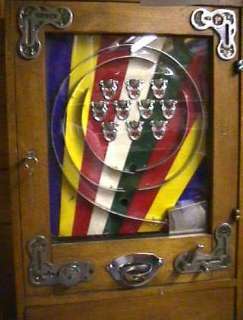 A version of the Pilwin Play, but with the later 1955 mechanism, multiple payouts and single ball exit. (Note Pilwin's teeth!) The game still has the early backflash and the closed loop track. This photo shows another transitional variation. 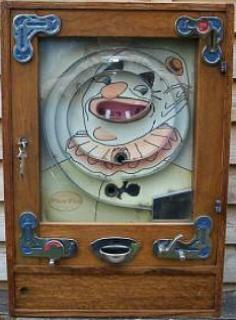 It has the later backflash and the later mechanism, but is fitted with the early spiral track of the Pilwin Play! 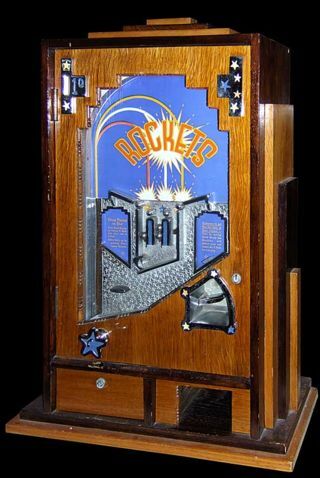 Incidentally, this is not a Pilwin Play that has been 'upgraded' by fitting a later backflash and mechanism, because there is only one ball exit hole in the wooden panel behind the backflash. 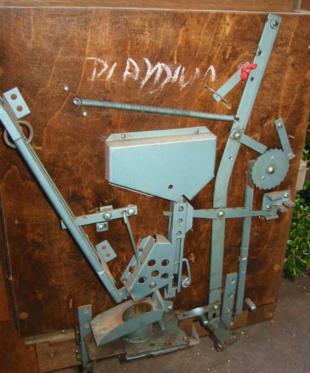 Early Pilwin Plays had 2 ball exit holes, so this machine was never fitted with an early mechanism. This curious hybrid was found in a Four-Square (as most unusual variants seem to be). There is some confusion about the date of introduction of the Fivewin. It is documented as 1956 but this is almost certainly wrong. An original example has been found (with matching serial number) in a 1954 Four-Square. The simple design of the Fivewin suggests that it may have been Byans first Allwin, predating the 1953 Pilwin Play. 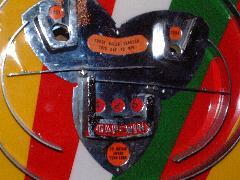 Early Fivewins had a 'homemade' backflash consisting of separate black and orange strips cut out and stuck onto the playfield. This was the origin of the familiar stripey pattern used on all of the later Allwins. By 1955, Bryan had perfected his standard Allwin mechanism, and the Elevenses was the first game to use it. The Elevenses went on to become the most popular Allwin of all time. The long line of eleven winning cups made the game look very easy. Bryans trick was the use of spring steel deflectors above the cups. Instead of being fixed to the playing surface (as was usual with this type of game) these deflectors passed through the backflash and were fixed to a bar mounted some distance behind the backflash. Consequently they were considerably longer and more springy than they looked! A ball hitting one of these deflector pins would bounce a great distance, and usually ended up bouncing off all of the pins, straight into the Lose hole! This game had three different values of winning cups, and a replay feature - all customisable. 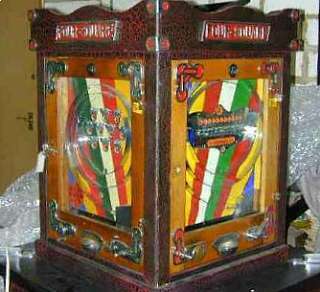 The Tencup allwin had ten individual cups positioned in the centre of the playfield, rather than in a straight line. This arrangement provided more suspense, due to the ball gradually trickling down the playfield and teetering on the edges of the cups. The payout of the Tencup could be adjusted so that the top row of cups paid out extra coins, with the top left cup awarding the biggest payout. This example is from the Tencup. 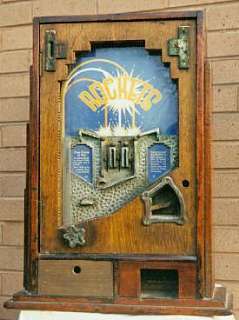 Coins falling down the chute on the left drop into the payout tube. 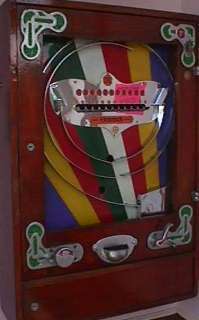 Rotation of the payout knob operates the slide underneath the payout tube, delivering a pre-determined number of coins to the player. 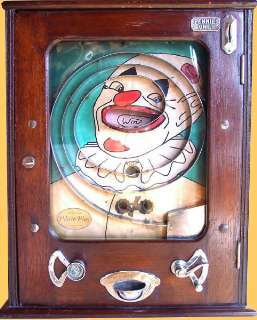 Winning balls are directed into 1 of 3 receptacles, allowing the payout knob to be turned once, twice, or three times. Note the additional payout slide hanging on the left. The ratchet wheel on the far right operates the Variable Pressure Unit, which varies the hammer pressure. 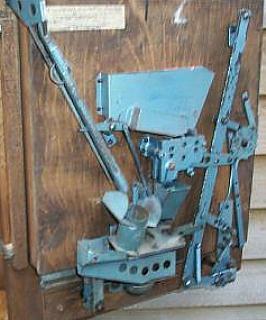 Compare this with the early mechanism from the Pilwin Play. 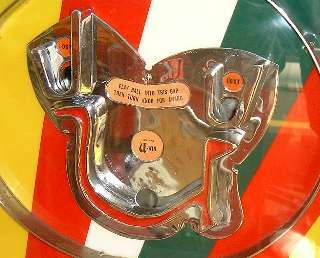 This Allwin presented a very large open U-shaped cup as the winning receptacle, and a pair of much smaller 'Lose' holes at either side, also U-shaped. The title of the machine was also meant to suggest 'You Win'. The huge size of the winning cup made it look impossible to lose at this game, but the positioning of the 'Lose' holes was cleverly arranged so that the ball usually dropped into them rather than the much larger winning cup. Note how the 'U' cup is cunningly tilted clockwise so that the right-hand 'Lose hole is lower than the left-hand one. Most balls would hit the raised edge of the left-hand 'Lose' hole (which could be adjusted up or down to vary the difficulty). Any ball clearing this obstacle usually had sufficient momentum to carry it on to the other 'Lose' hole! 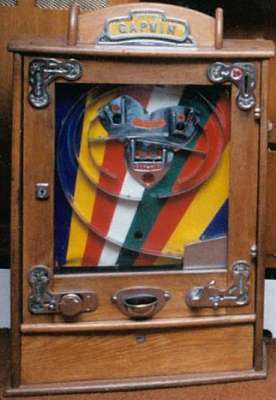 The U-Win was a single-payout machine. then turn knob for award"
The Gapwin's rarity is something of a mystery. 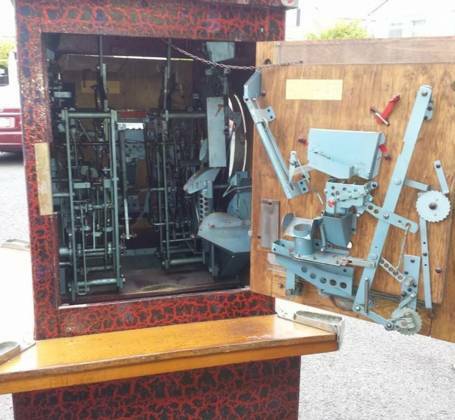 I have been collecting these machines since 1995 and have never seen a single Gapwin at a UK auction, and yet during this time most of Bryans supposedly rarest machines have appeared at auctions, many of them more than once. This is even more mysterious as Gapwins do not appear to be particularly rare; and yet as time goes by, more and more collectors are searching for one. My value above is based on private sales, ebay, and advertisements, but I suspect that if a Gapwin were to come up for auction now, it might fetch considerably more than that! Update: An unrestored Gapwin sold at auction in 2013 for £2300+10%. 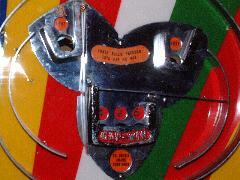 Close-up detail of Gapwin's levers Message reads: "Three balls through this gap to win"
The Four-Square consisted of four of Bryans ordinary Allwins mounted in a square case and standing on a pedestal. These pedestals could be located in a more central position in the arcade. 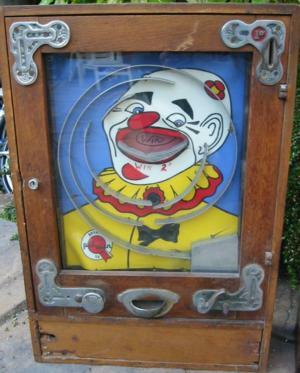 Although each of the machines was a standard Allwin panel, there was no separate cash box at the bottom of each one. This is because the overflow coins from all four games fell into a large central hopper in the pedestal. This collection of Allwins is from a Bryans sales catalogue. A note about values: These were included on the site because 80% of emails received by me are of the type "I have xyz machine - how much is it worth?". The values are based on the best information available at the time, but they are subject to large fluctuations due to the condition of the machine, the case style, and the demand for it at the time of sale. There is no guarantee that your particular machine is worth the amount shown on this site. All values are in GBP (£).